"The Artistic Series, No.61, The Country Seat of Wm. 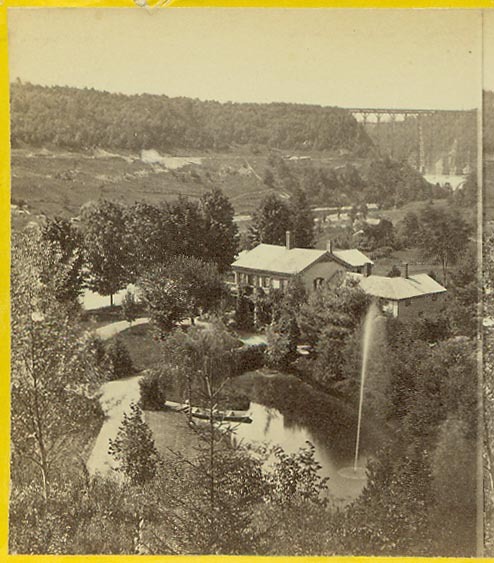 P. Letchworth-the Horse Shoe Fall and Portage Bridge in the distance, Portage, N.Y.
E & H.T. Anthony & Co. 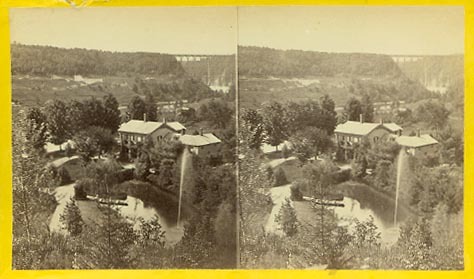 This is the classic view of Mr. Letchworth's Glen Iris Estate. The image was probably taken in the late 1860's from what would become the Council Grounds. You can see the Glen Iris with its manmade "lake", fountain, and winding pathways. In the background is the Portage wooden Bridge. You can also trace the cut of the Genesee Valley Canal on the hillside across the river. Look closely at just below the tree line.